Topps has annouced the first Red Hot Rookie Redemption from their 2008 Topps Series 2 product. 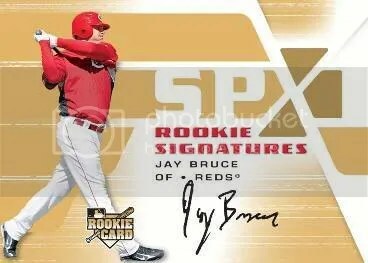 Its none other than an autograph of…………………………………………………Jay Bruce. Each box contains one of these redemption cards. Topps says this will be part of a 20 card set. The card will look like a Topps Chrome Refractor. In Upper Deck’s attempt to compete against Topps, they have created a “Mystery Redemption” program kinda like how the Topps Finest redemption cards work. Upper Deck put these mystery cards in their 2008 SPx product. 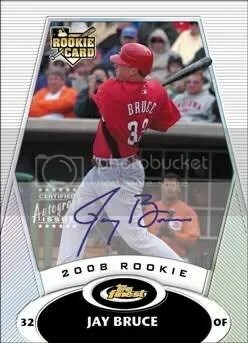 Today Upper Deck annouced that card number one in this rookie redemption set is Jay Bruce, which is autographed. Looks pretty cool. This week’s eTopps cards are…………. 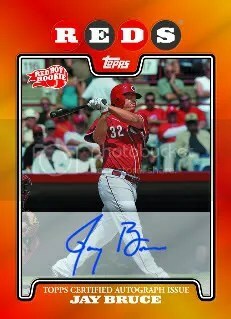 Topps has annouced that the #2 redemption card in their 2008 Topps Finest baseball cards is Jay Bruce. Not only will it be a rookie card but it will also be autographed. Jay Bruce is one of the biggest prospects in baseball, going 3-3 his first night up with the Reds.